By 3 years of age, 80% of dogs and cats will show signs of gum disease. Help prolong the life of your pet, prevent periodontal disease and control bad breath by scheduling a dental cleaning. Contact us to schedule your appointment today. 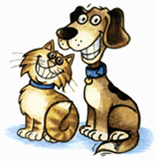 Receive a free pet dental care product. Get $10 in JVC Dental Dollar$, redeemable toward future services. Get $20 in JVC Dental Dollar$, redeemable toward future services. 3) New Clients, receive $20 in Dental Dollar$. Offer Expiration: Appointments must be scheduled in the month of February 2015.